The number of recruited soldiers in three different forces in six different years. 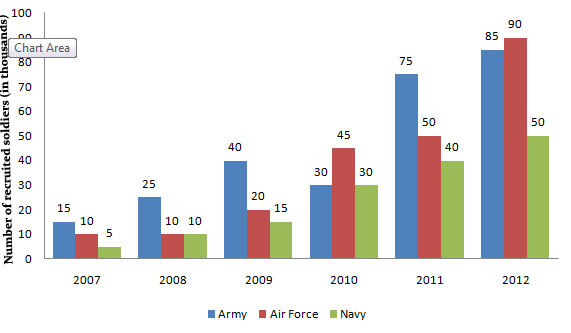 1).What is the average number of soldiers recruited in Navy in all years together? 2).The number of soldiers recruited in Navy in year 2011 is how much percent of number of soldiers recruited in Army in year 2008? 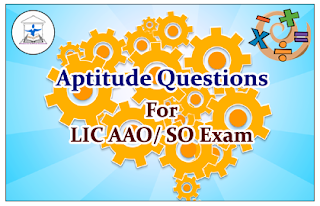 3).If in the year 2012, 30 percent of the soldiers recruited in Air force were female then what is number of males recruited in Air force in that year? 4).What is ratio between the numbers of soldiers recruited in Air force in year 2007 to the number of soldiers recruited in Army in year 2011 respectively? 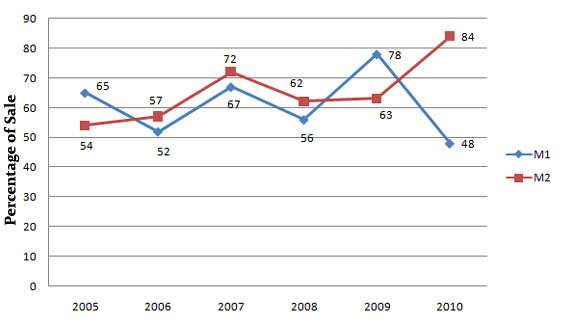 5).What is the percentage decrease in the number of soldiers recruited in Army in year 2010 as compared to last year? Number of M1 and M2 T.V models produced by a company in different years. 6).What is the total number of M1 and M2 model T.V sold in 2006? 7).What is the respective ratio between the number of M1 model T.V sold in 2010 and M2 model T.V sold in 2005? 8).The number of M2 model T.V sold in 2009 is approximately what percent more than that of same model in 2007? 9).What is total number of M2 model T.V sold in all the year together? 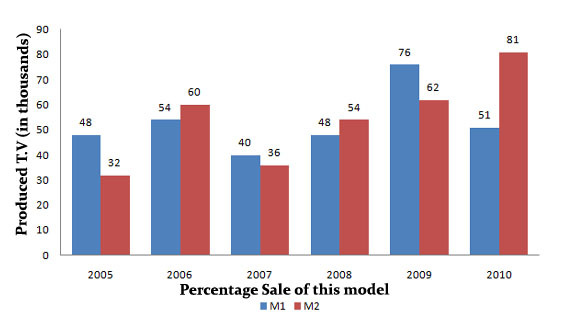 10).What is the difference between the numbers of M1 and M2 model T.V sold in 2008?